Ever since the Reagan Administrative, tax brackets have been indexed for inflation. This avoids bracket creep when taxpayers move into a higher tax bracket because inflation pushes up their income. The thinking is that inflation increases are not real increases in earnings, so the rate tables should be indexed to avoid tax increases arising solely from inflation. This seems like less of an issue today with relatively tame inflation rates, but remember that inflation went into the teens in some years in the1970’s making bracket creep a big issue. The new Act changes rate indexing and other Code indexing from the former Consumer Price Index (CPI) to a new creation known as “chained CPI.” Chained CPI is an adjustment to CPI that reduces the inflation rate by attempting to factor in human behavior that when prices rise, some consumers will look for less expensive substitute products, so that the overall inflation is lower than it would first appear when measured by actual spending. I have seen estimates that the effective tax increase next year will be $800 million, and is estimated to be $31.5 billion by 2027. Bracket creep tends to burden lower income taxpayers more than higher income taxpayers, because the brackets are smaller and thus will trigger more increases on the low end - further, for taxpayers already at the highest rate there is no higher bracket to creep into. The wealthy will still be impacted as the unified credit exemption from transfer taxes is now coming under chained CPI adjustments. This means slower increases in such exemptions and thus more potential transfer taxes. 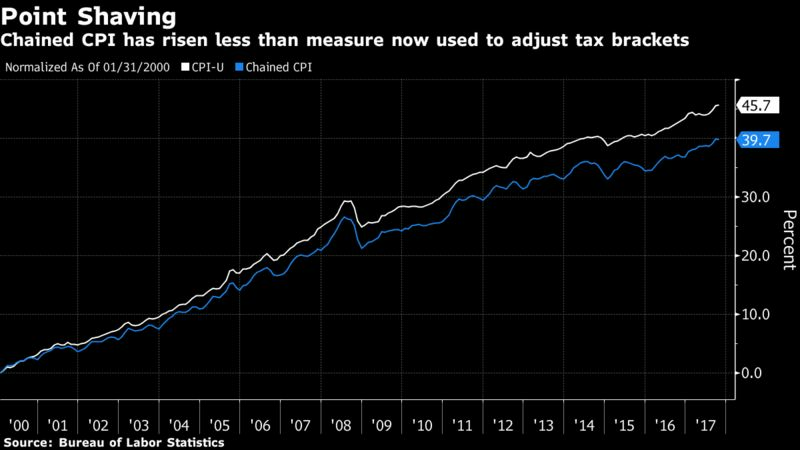 It is interesting that chained CPI was brought in by the Republicans and in a tax cut bill. I assume it was included to help the budget numbers work. Note that Pres. Obama tried to bring chained CPI to social security increases during his administration which would have the effect of reducing social security payouts, but was beat down by Democrats. Don’t be surprised if we see that before Congress again in the near future.